Little Bit Funky: it was worth it. i am super grateful to have in-laws like i have. people who i can spend a week with. and still love, want to talk to and look forward to seeing again soon. it was a good week and i am so glad that i was brave enough to do it alone. we missed doug...but my boys got a week of time and love from their family. and that was worth it. here's our week in as few words as i can muster. we swam. a lot. i think the average temp for many of the days was 95-100 plus gobs of humidity. we played with cousins. at the lake that daddy grew up on. we spent time with Doug's grandparents. both who are nearly 90.
this photo is precious to me...nearly 90 great-pa having a chat with four of his great grandkids. precious. the boys got to see all of their aunts and uncles. another reason that made me go. how often would they get the to see them all at the same time? 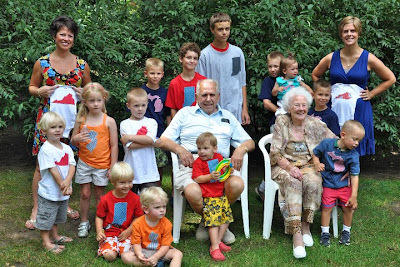 the great grandparents got to see ALL of their great grand kids at once. 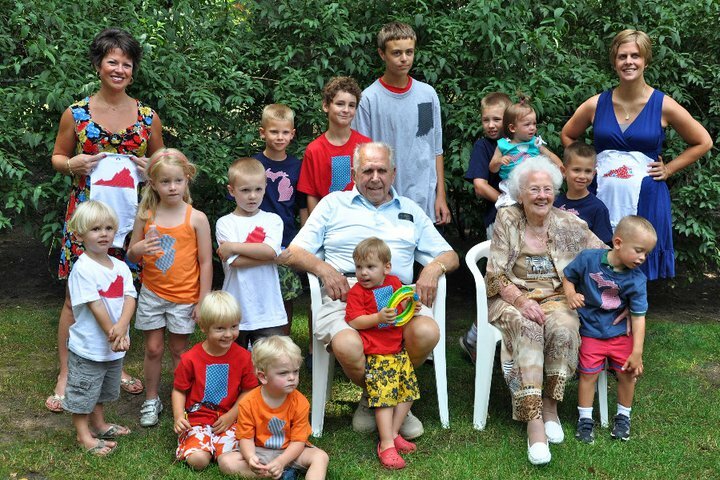 and all but three of their grandkids. i'm so glad i didn't wuss out. i shared a room with this kid. i don't miss 5:14am wake up calls. the boys made memories at a place that is super special to doug. i learned how to make a norwegian wedding cake. which moses has requested for his birthday. norway is a special place to us and we are just heartbroken over the events there. the wedding cake tastes awesome. i had it for breakfast on sunday and lunch today. 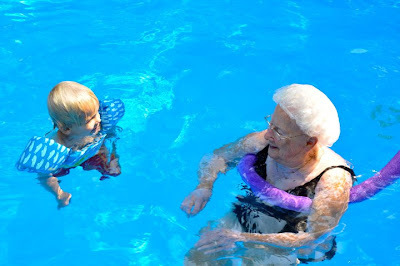 moses got to have six hour swim day with ALL of his extended cousins. it was SO fun to see all these little kids running around with different shades of blonde. they were a bunch of little norges for sure. and these four got lots of quality time together. it was a great week. and i only made two wrong turns the ENTIRE week. and if you know my lack of internal GPS, is pretty amazing. somehow i feel ready to get my bum in gear and get to work. thanks for enduring all my photos. glad you are back and glad you had fun! Oh what fun!!! Wonderful pictures and I adore your Catherineholm bowls!!!! Norwegian wedding cake is very yummy! I got to live there for 15 months over 10 years ago - I miss that country to much! Wonderful people who know how to entertain - and how to entertain for hours! I too am heart broken about the events there. I can't believe anyone can be so brutal to individuals and their beloved country! (I don't know any nation with more pride honestly!) I love reading your blog and catching all of your references to Norway! I'm getting set to make myself the traditional Norwegian birthday cake - Blotkake! Yum! What fun. I bet those great grandparents have never been happier. 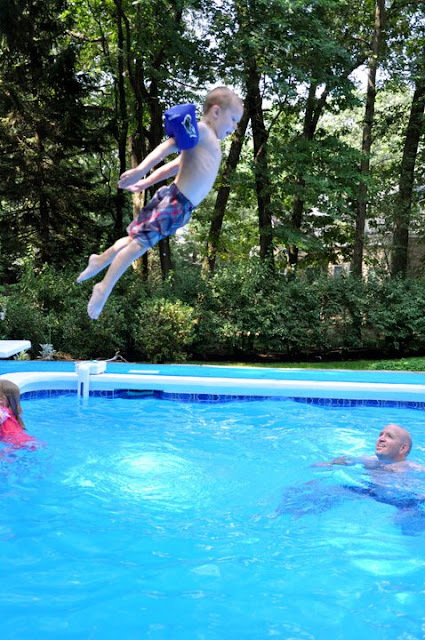 I love the photo of Moses jumping into the pool! Great shot! Beautiful! Sure is wonderful to hear. 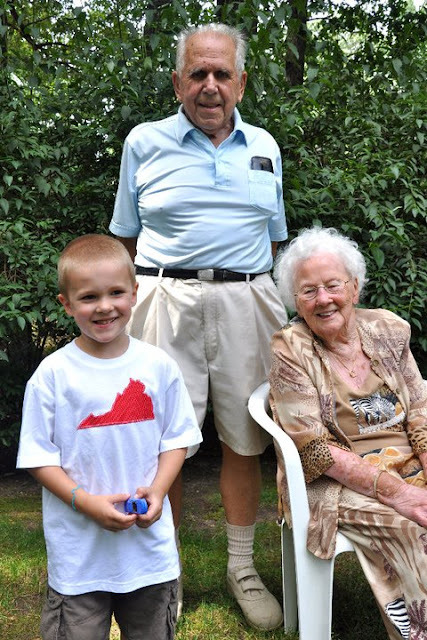 Those great grandparents are looking terrific and it will be precious memories for you all.